A beautiful well laid out comfortable Montessori classroom for 12 preschool children. 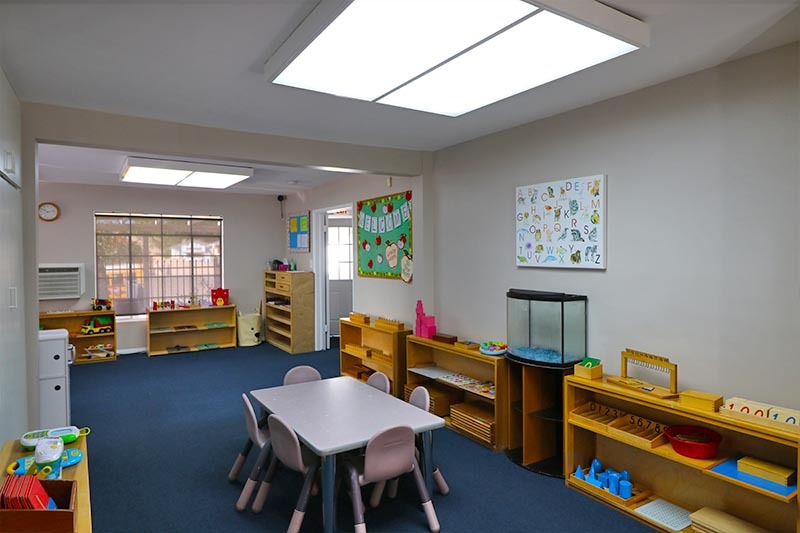 An intimate classroom where the foundation for Montessori learning begins. Our curriculum creates a a developmentally appropriate learning environment that empowers preschool children to be confident, successful, lifelong learners. Vocabulary expands from a few hundred words to a few thousand and word comprehension takes off during the preschool years. Our preschool programs and curriculum provide children with opportunities to integrate listening, speaking, early reading, and writing into daily activities such as recognizing letters and discriminating between sounds, answering open-ended questions such as "What do you think? ", participating in projects that have multiple steps, playing language and rhyming games, following along in children’s books read to the class, & dictating thoughts and ideas to teachers about artwork. Whether they are counting how many marbles they have, fitting a cylinder into a circular hole, or asking for more milk, preschoolers are constantly using and experimenting with math concepts. Our preschool teachers create learning experiences that build math skills and reasoning so children can solve problems and use mathematics in real and meaningful ways, such as, sorting items by size, color, or shape during clean-up, stringing beads in a pattern, discussing past, present, and future events, counting out small groups of items and matching to a numeral card, playing estimation games such as "Which jar has more pebbles? ", experimenting with measuring cups in the sand or water table, preschool children are constantly engaged in research and experimentation, testing hypotheses, exploring properties, making important discoveries and learning how things work. Through our preschool science curriculum, teachers carefully plan experiences that not only develop scientific skills but also nurture children’s natural curiosity, such as investigating objects on a light box or light table, predicting daily weather, using microscopes and documenting observations through pictures and charts, problem solving with the guidance of teacher prompts, exploring maps, magazines, and other resources. Artistic exploration encourages important skills such as creative thinking, adaptation, problem-solving, innovation, and follow-through. Our preschool teachers nurture children’s own artistic abilities and help them appreciate art. Preschoolers are actively developing their sense of self and who they are in the world. Our preschool teachers create respectful and diverse learning environments, helping children understand the world they inhabit. Teachers also present unique experiences for children, enhancing a preschooler's sense of responsibility and compassion for people, by Sharing cultural and family traditions with the class, exploring photos of children and adults who are similar or different from us, playing collaboratively with peers and caring for classroom plants. Because young children are forming attitudes and behaviors that will influence them throughout their lives, it is important to expose them to experiences that foster their ability to make good health decisions, develop a positive self-image, make healthy nutrition choices, and show respect for their bodies. Our preschool teachers provide children with varied opportunities and materials geared towards developing healthy lifelong habits, such as making their own choices at snacks and meals, identifying nutritious foods and how they help our bodies grow, taking responsibility for his/her own basic hygiene such as proper hand washing and covering his/her coughs, engaging in physical activities - hopping, climbing, yoga and following procedures for a fire/ earthquake drill.